Have you ever been looking at a web page or reading something in Safari on your iPhone and then accidentally closed it? Or maybe you closed the tab and then realized you weren’t quite finished with it, or you’d like to get that closed tab back for some other reason? You can easily re-open closed tabs in Safari on the iPhone, but you’d be forgiven if you overlooked the feature. 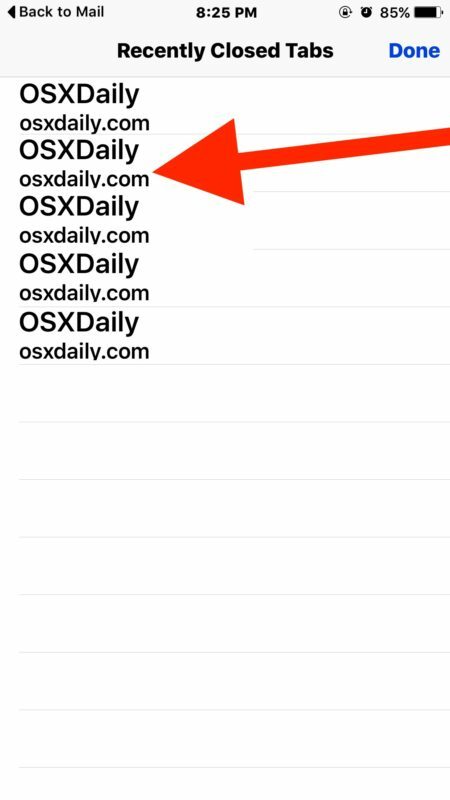 This tutorial will demonstrate exactly how to reopen a closed tab on iPhone Safari browser. You can repeat this to reopen as many recently closed tabs as you want in Safari for iPhone. Note that if the tab was closed too long ago, it won’t be available to reopen. 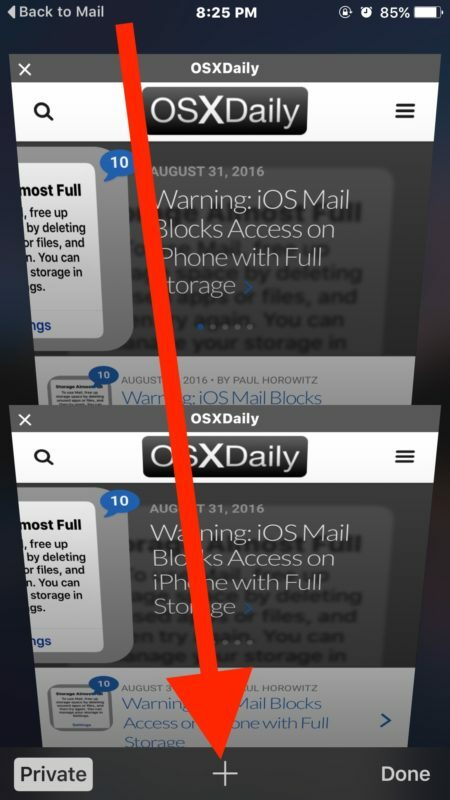 Note the subtle difference between how opening closed tabs is performed in Safari on iPhone and iPod touch versus the similar but different trick to re-opening tabs in Safari for iPad. This is largely because the iPad version of Safari has the + new tab button visible all the time, whereas the iPhone version of Safari has the new tab button hidden behind the tabs overview button. Of course desktop and laptop users also have this ability, where it’s arguably even easier as you can go aboutreopening closed Safari tabs on Mac with Command+Z keystroke combination. Great idea. Doesn’t work on my iPhone 6 Plus running iOS 9.3.5. If you want to try it yourself open a few Safari tabs, then close one or two of them. Use regular browsing mode, not private. The ability to reopen closed tabs is a feature of iOS, it works on all modern iPhone, iPad, and iPod touch models running any modern iOS release. The instructions here demonstrate this on an iPhone Plus with iOS 9.3.5 and iPhone Plus with iOS 10. You must have closed a tab recently in Safari to be able to reopen a tab, if there are no closed recent tabs then you will find the feature is blank. Your demo appears to show you performing the trick while in Private mode though; perhaps new screenshots should be taken that properly reflect this? Thanks, the problem was Private Mode. Works fine with regular browsing mode (which, however, I rarely use). Works great. Thanks for the tip. I wish Apple didn’t hide these features! I find the instructions are very clear, I can’t imagine why people are not following them and messing it up. Works on iPhone 6 and iPad, both at 9.3.5. Doesn’t work also on my iPhone 6+ using iOS 9.3.5. Pressing + does bring up the window Recently Closed Windows but no data even after I closed several tabs. Hi it should work for the iPhone 6 Plus? Works on mine I have the same phone. Same iOS 9.3.5. Do a reboot of your phone and try again. Go and open a few web pages, a few from your book marks then close some and follow the tips. I can’t see any reason why this will not work. As you are using a built in option of the phone. Won’t work if you’re smart ebnough to use private browsing mode (so web sites et al cannot track your use and access your data). Otherwise it works fine but leaves you very vulnerable. I’ve accidentally closed all tabs (approximately 12 tabs) which are important to me. Your above mentioned way shows the last 5 tabs alone.. How do I get back rest of my tabs? Pls try around & tell us any available tricks.. Anyone know how to get tabs back after they disappeared after I cleared my website history and data? I just had all of my tabs closed on safari. I have an iPhone 8 plus with IOS 12.1.4 software. I was looking for stores where they sell a food product that I enjoy. The website said I need to have cookies unblocked. I didn’t even have cookies blocked in the first place. I went into settings and when to Safari and then scrolled down to Block All Cookies, because I thought that by toggling the button on and off that it would enable cookies. I was horribly wrong. All of my tabs were closed. I read this article and tried to do what it said to reopen my closed tabs, but the recently closed tabs was blank. Even though I had over 300 open tabs. Where did they go? And why aren’t they showing up on the recently closed tabs page? I am desperate for any way to get the tabs back. PLEASE HELP!!!! !